I received my Velvet Hotshot device last year and did an initial review of it. Around the same time I also collected some data on signal strength for the device but didn't have time to really look into it or write about it due to an extended period of travel. Now I've finally got around to looking at the results, so lets see how well the Hotshot stacks up. Velvet WiFi has closed for business but if you still have one of their Hotshot devices, you can turn it into something useful. Check out this article for more information: Installing LEDE on Velvet's Hotshot aka MiWiFi Mini router. 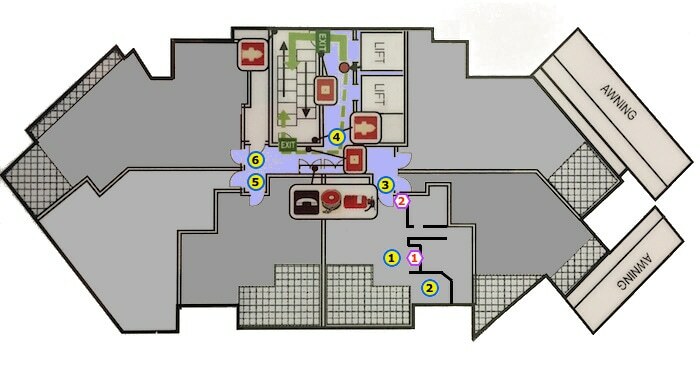 Below is the floor layout of my building, there are 6 apartments on the level I tested the Hotshot on. Each of the apartments is coloured in a different shade of grey. I picked two locations to test the Hotshot from, one was next to my existing WiFi router in the centre of the apartment (purple hexagon with the number 1 in it). The second location was right on the inside of the entrance door to the apartment (purple hexagon with number 2 in it). The yellow circles are points where I took measurements from. These are the results when the Hotshot was essentially in the middle of the apartment, at position 1. Note that test locations 5 and 6 were not tested at this point since there was essentially no signal to test with. These results are from position 2 for the Hotshot, test locations 5 and 6 were possible to test in this case. Note: I could only measure the signal strength in 'bars' as shown on my phone, it's not a very accurate measurement but realistic enough because that's what the end user would see. The round trip time (RTT) is shown in milliseconds with the first number being the average RTT and the number in brackets showing the standard deviation. Looking at results from Hotshot position 1, it becomes clear that the signal simply does not reach outside of the apartment. For a typical WiFi router this would be very desirable, but since the Hotshot is designed to share your Internet with others, you would not get anyone actually trying to connect to it, defeating the point of installing the device in the first place. Results for Hotshot position 2 look more promising. The signal could reach much further, but still didn't work too well when it came to dealing with corners, which was to be expected. I would expect that the apartment immediately next to the one that had the Hotshot installed would be able to connect but none of the other apartments would even get the signal. So overall, considering both of the results I think the Hotshot could do very well as a device to share Internet in large open areas like cafes or restaurants, but isn't powerful enough for sharing Internet between multiple apartments. I'll report back in a few months after my Hotshot has been running for a while to see if anyone actually tried to use it.